Such an ambitious project! Love how it turned out…you SHOULD be very proud! I am in love already!!! Our entryway is small like yours looked at first…now I have hope that our can look as good as yours! Good! Moving those newel post back really helped a ton! Your entry way looks amazing !!! Its not easy but is worth it. Such a great transformation. Thank you! It was a great space! YAY! I will roll out the reveal tomorrow! I love your tip about drawing possible design changes on a photo. Your changes look fabulous. The transformation is just incredible. It really looks stunning. It turned out beautiful! You should be proud! I really like it. I want to do something to our stairwell. It’s dark and I hate the carpeting. I’ve liked the steps on Pinterest that have numbers or writing on them. Still thinking, but really want to make sure it what I want to live with. Thanks for sharing. Gloria, you are welcome! I hope that you get to do your stairs some day. I love this project. I especially love the blue picture on the landing. Did you make this or buy it? If you bought it, where? Can you post a photo of it up-close? Thanks! It looks amazing! Do you have any tips and/or tutorials/instructions on making an archway like that? Wanting to do one between my living room and kitchen! I love that gate! We’ve had issues with stairs and dogs for the past three moves but have never come up with something so well blended to the rest of the house! I am wondering how exactly it functions? Does it simply slide to the side, or is it hinged? Either way it is gorgeous! Alexandra, in this case it slide to move out of the way, but we also have tried (and it worked really well)screw hooks in to the wall and then hung it from those. Hope that helps! What a fantastic project! I’ll be linking to it on our Flooring pinboard. Check it out at pinterest.com/homedepot. Wow! I am so inspired! 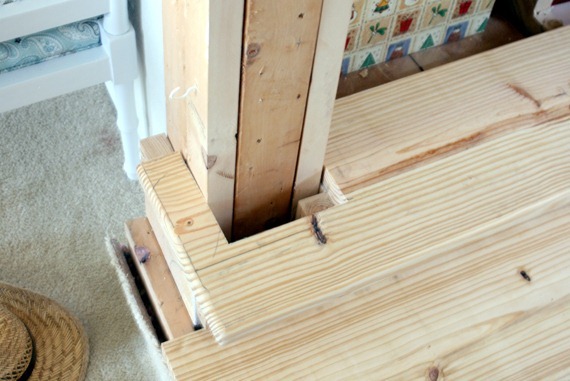 I apologize if i kissed this in the post but did you replace the wood on your stairs or was that the wood that was under the carpet? ?? Thank you. Nicole, the whole process was a bit long you can read everything we did in these posts: https://www.remodelaholic.com/tag/park-house-stairs/ , but yes that was the existing wood with a bit of finagling to get it to look good! Jenny one thing you could do, is to do a test with the additional height. Buy a 3/4″ board and cut it into small 6″ pieces. Set those pieces on the existing tread. This will give you an idea if a 1 1/2″ tread would feel off. I hope that helps. Sorry it took so long to respond. Take a bow for your work. Beautiful job. Thanks for the step by step pics. I’ll start mine one day soon. This posting gives me courage to take it on. It did a same kind of renovation. To protect the noses of the stairs i installed Stair Nosing. OMG. The “after” photo does not even look like the same house. 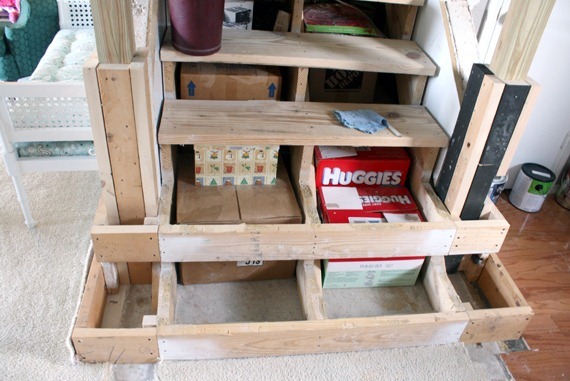 Your staircase and entryway looked so ordinary before. But now, well, they look spectacular. Great job, guys! 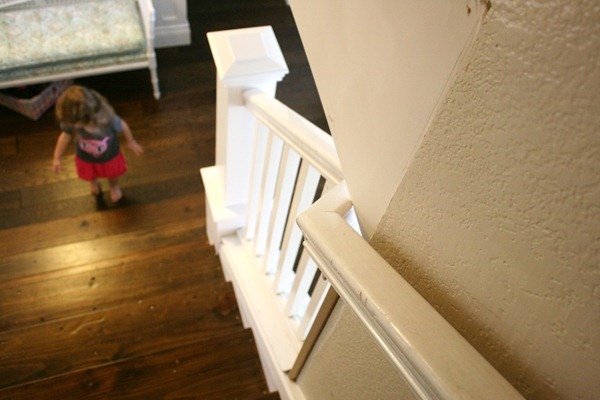 We are paying to have wood stairs put in and wrought-iron balusters with newell posts. I just hope they turn out as beautifully as yours did!! You doing your Victory Descent made me crack up. I can totally relate to your elation. 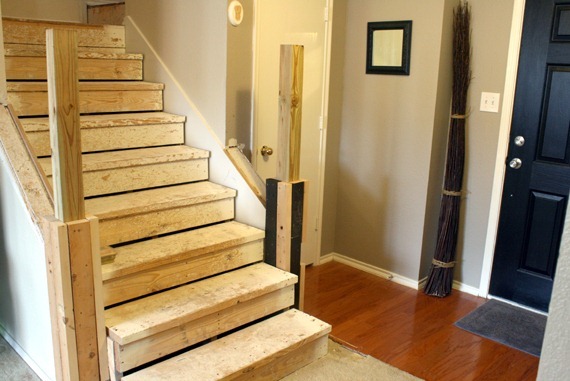 Your stairs turned out beautifully. Thanks for sharing. Love it! Thanks for sharing this…can’t wait to get started! You’re welcome, Susan! Thanks for the comment! Great write-up. My wife and I are discussing ripping up our carpeted stairs and converting to stained wood. 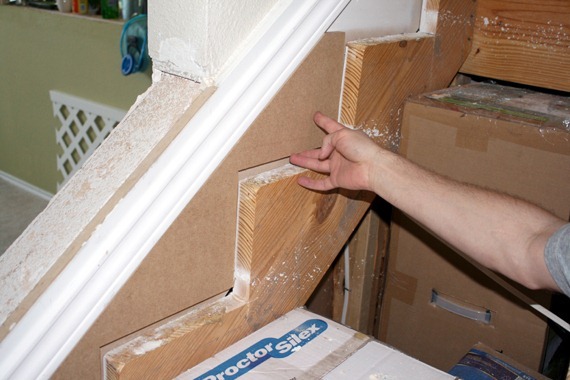 Unfortunately our stairs are made of waferboard and shims for the most part. It will be a monumental project because I will essentially have to re-build the stairs completely. Cheaply built house, but we’re trying to make it better. This write-up is giving me a lot of ideas. Thank You! Thanks for the comment, Travis! Best of luck and we’d love to see pictures of what you end up doing!